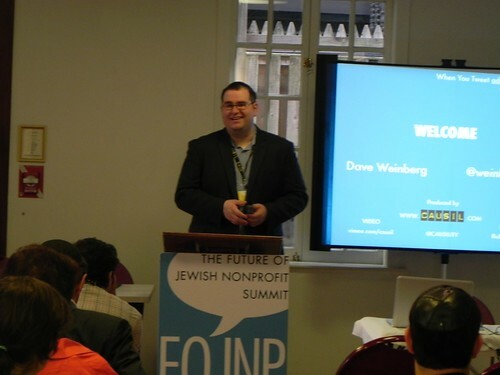 Causil’s David Weinberg at the New York FOJNP summit. Photo credit: Copyright © Causil. Used with permission. The Future of Jewish Nonprofit summit was a wonderful kick-off for my job search — a mysterious and nebulous art with thousands of books on the subject and no right answer of how to do it. (There are 23,605 books according to Amazon, two of which I’m reading now.) Everything that I’ve read agrees on one thing, that you need to reach out and speak to as many people as possible. For that, I am thankful to Dave for the FOJNP summit. It gave me a chance to practice my networking skills, and to get advice from people who are important members of the Jewish nonprofit world. Ventureneer‘s Geri Stengel talking on a panel with Saul Orbach (TMT Strategic Advisors) and Avi Zollman (Jewish Funders Network) talking about the challenges of raising funding in today’s economy. The important take away: make sure you’re evaluating what you do, and publishing those evaluations as a story anyone can understand. People of my generation want to know where their money is going. Big Duck‘s Farra Trompeter talked about about Google+. It’s really fun to think about the constantly changing social networking landscape — and how we can best take advantage of the changes. LinkedIn professionals gave some tips on how nonprofits can best use the network. Basically, spend some time getting to know http://learn.linkedin.com/nonprofits and follow their advice in the help documents. (Since I’m looking for a job, I’m going to be spending a lot of time looking at the job seeker section) of their site. Hadassah Levy of Jewish Ideas Daily made me realize that I need to update my blog more, and that I should try and get more involved in the organizations I care about.